We’d love your help. Let us know what’s wrong with this preview of Amish Sweethearts by Leslie Gould. They've been best friends for years, but as high school ends, Zane Beck can't help but look at his Amish neighbor, Lila Lehman, with different eyes. Her controlling father sees only one future for Lila, though, and arranges for her to be courted by an upstanding young Amish man. When Zane sees the two together, his plan Can These Two Friends from Opposite Worlds Find Love? They've been best friends for years, but as high school ends, Zane Beck can't help but look at his Amish neighbor, Lila Lehman, with different eyes. Her controlling father sees only one future for Lila, though, and arranges for her to be courted by an upstanding young Amish man. When Zane sees the two together, his plans for the future crumble, and he impulsively enlists in the Army, following in his father's footsteps. To ask other readers questions about Amish Sweethearts, please sign up. AMISH SWEETHEARTS is the second book in Ms. Gould's Neighbor's of Lancaster County series. Fans will want to read the first book, Amish Promises, since this series does not stand alone. I wanted to like AMISH SWEETHEARTS better than I did. I looked forward to reading Zane's and Lila's story. Zane grew up to be a wonderful young man, kind, considerate, and serving the country, like his dad and his dad's best friend, Charlie. He did end up second guessing his decision, but I'm sure that is normal AMISH SWEETHEARTS is the second book in Ms. Gould's Neighbor's of Lancaster County series. Fans will want to read the first book, Amish Promises, since this series does not stand alone. I wanted to like AMISH SWEETHEARTS better than I did. I looked forward to reading Zane's and Lila's story. Zane grew up to be a wonderful young man, kind, considerate, and serving the country, like his dad and his dad's best friend, Charlie. He did end up second guessing his decision, but I'm sure that is normal for most young people in the military, especially those who are deployed for ongoing war. Lila moved on (sorta) loving Zane but being courted by Reuben, and she wouldn't talk to Zane when he was home, but then sulked when he respected her boundaries. In the second book in the Neighbors of Lancaster County the stories of the Lehmans and the Becks continue as their children have matured. As children Zane and Lila played together and shared their dreams. All that changed when Lila's father arranged for her to court an Amish man from her community. Zane couldn't watch Lila with Reuben, and made an impulsive decision to join the Army rather than seeing his beautiful friend courted by another. Amish Sweethearts is a powerful story of relationships In the second book in the Neighbors of Lancaster County the stories of the Lehmans and the Becks continue as their children have matured. As children Zane and Lila played together and shared their dreams. All that changed when Lila's father arranged for her to court an Amish man from her community. Zane couldn't watch Lila with Reuben, and made an impulsive decision to join the Army rather than seeing his beautiful friend courted by another. Amish Sweethearts is a powerful story of relationships and grave disappointments. Overwhelming responsibilities play a major role in this touching story of two very different families and the beliefs that separate them. Danger has become a way of life for Zane as he is shipped to Afghanistan with no guarantees he'll return home. His faith is the only thing that keeps him going. Lila continues to court Reuben while questioning if she can truly love him. When past family secrets surface Lila must consider all options. Leslie Gould has created an extraordinary novel developing the lives of two very different cultures through their likenesses and differences. Although beliefs and customs separate the two cultures, humans still share the same needs and desires. Two stories woven into one very dramatic narrative create a strong human element that evokes a plethora of emotions throughout the novel. I highly recommend Amish Sweethearts. In my opinion this is Leslie Gould's most impressive novel to date! Zane Beck and Lila Lehman have been neighbors for years, practically growing up together. They have played together along with Lila's brothers and sisters, being best friends to each other. The big problem being grown now is Lila is Amish and Zane is English. They are realizing their feelings for each other have changed but won't admit it to each other. Lila's father is pushing her to court and marry the bishop's son. She is pushing Zane away, so much so that he joins the army. Then he is deploy Zane Beck and Lila Lehman have been neighbors for years, practically growing up together. They have played together along with Lila's brothers and sisters, being best friends to each other. The big problem being grown now is Lila is Amish and Zane is English. They are realizing their feelings for each other have changed but won't admit it to each other. Lila's father is pushing her to court and marry the bishop's son. She is pushing Zane away, so much so that he joins the army. Then he is deployed to Afghanistan in a war zone. Is there any way for them to ever admit that they love each other, and even if they do, almost impossible to have a relationship when their worlds are so far apart? You need more than feelings to fuel a good marriage. You need a love that is steadfast, faithful, and strong. If you have never read an Amish novel, I would encourage to pick up on this series of Lancaster County. As a Christian and a human being, these novels demonstrate commitment. Choosing the good thing to be committed to is a struggle but the rewards of living a life of commitment is eternal. Amish Sweethearts is a clash of three worlds. Neighbors Zane Beck and his English family and Lila L You need more than feelings to fuel a good marriage. You need a love that is steadfast, faithful, and strong. If you have never read an Amish novel, I would encourage to pick up on this series of Lancaster County. As a Christian and a human being, these novels demonstrate commitment. Choosing the good thing to be committed to is a struggle but the rewards of living a life of commitment is eternal. Amish Sweethearts is a clash of three worlds. Neighbors Zane Beck and his English family and Lila Lehman and her Amish family. Lila and Zane grew up together being the best of friends. As they grew older and the attraction became more, Lila knew no good thing good come from continuing their friendship and more or less sent Zane to the Army to Afghanistan. Enter the clash of the third world. In his mission of helping the Afghanistan people, he longs for a way for him and Lila to be together. Lila has moved on with the courtship of Reuben the Bishop's son of her Amish community. Her heart however, has not moved on. Delaying marriage and thinking about Zane realizing that Zane is the one that feeds her soul. Both Lila and Zane both come to realize what true commitment is and that commitment starts with being honest with yourself. Some of the quotes I found inspiring and endearing. He also made her heart break in two. But he did make her feel, that was for certain. Decisions made with the brain and decisions made with the heart. Those heart ones are hard to control sometimes. I think God expects us to protect those who are vulnerable. He didn't deserve her, but he guessed that was what love was. The Amish girl is telling me to go back to find my peace? She was the biggest liar she knew. Please forgive me, she prayed. She needed the community of her church, but she needed Christ's salvation more. I absolutely loved this book. It speaks to the heart of what we all crave in commitment. It speaks to the heart of Psalm 46:10 "Be still and know that I am God." A Special Thank You to Bethany House Publishers and Netgalley for the ARC and the opportunity to post an honest review. They gave up on each other sometime ago. Or so they had convinced themselves. When Zane Beck returns to sleepy Lancaster County he encounters his old, Amish sweetheart, Lila Lehman. And it's obvious nether one ever quite let go of the other. But they come from two different worlds and Zane has since joined the military. Anything that may at one time had been a possibility is now out of the question. And Lila's quiet and steady beau is getting impatient for her to say "yes" to his proposals. When They gave up on each other sometime ago. Or so they had convinced themselves. When Zane Beck returns to sleepy Lancaster County he encounters his old, Amish sweetheart, Lila Lehman. And it's obvious nether one ever quite let go of the other. But they come from two different worlds and Zane has since joined the military. Anything that may at one time had been a possibility is now out of the question. And Lila's quiet and steady beau is getting impatient for her to say "yes" to his proposals. When Zane is sent to Afghanistan he tries to keep casual communication up with Lila. When disaster strikes, the two must decide what they intend to do with their futures. Once upon a time I had an interest in Amish stories. I flat out devoured those types of books. But I've gotten past that phase since then. When I saw an acquaintance reading something by this author, I thought, what the heck, give it ago. So here I am. While this wasn't a bad book, it wasn't a great book either. I couldn't quite get into the charters or bring myself to care about any of them. I'm sure that readers who enjoy Amish stories will love it, but for me - well, I can definitely say no more Amish stories for me. DISCLAIMER: In accordance with the Federal Trade Commission’s 16 CFR, Part 255: “Guides Concerning the Use of Endorsements and Testimonials in Advertising” we would like to note that we received a copy of “Amish Sweethearts” provided by the publishers, Bethany House, in exchange for our honest review. I do not read very many Amish books. This was a free read from Bethany Books for review, but I did enjoy the story. It was a Book Two, but stood alone well. I do wish I had read the beginning of the friendship between Zane, a Mennonite neighbor, of Lila Lehman. Seems they played together and met frequently at a special fort during their late child years and teen years. When they got towards adulthood, they didn't know for sure how to process their relationship, being from two different church ba I do not read very many Amish books. This was a free read from Bethany Books for review, but I did enjoy the story. It was a Book Two, but stood alone well. I do wish I had read the beginning of the friendship between Zane, a Mennonite neighbor, of Lila Lehman. Seems they played together and met frequently at a special fort during their late child years and teen years. When they got towards adulthood, they didn't know for sure how to process their relationship, being from two different church backgrounds. One thing Lila knew for sure though was that she enjoyed being around Zane, his zeal for adventure, learning, and the ability to listen. She didn't finish high school, but Zane included her in this studies and they shared many subjects. Finally her father agrees for his daughter to be courted by a young Amish boy, Reuben, whom Lila also knew from church. She believed in commitment and thought that maybe she could learn to love him and that her time with Zane was over, and just a childhood crush. But she never felt entirely comfortable with him, very joyful or fulfilled. Her thoughts would always go back to Zane. Zane was so confusedf over his feelings and her courting, that although he had been a conscientious objector, he joined the Army to get away and think. It was a good thing and a bad thing, but eventually gave Lila time to see her mistake in not being honest to Reuben or Zane. The rest of the story is sweet...read it and see! Amish Sweethearts is book two in Lancaster County, but I would say you could read it as a stand-a-lone . Reading book one would let you get better acquainted with the characters. The story and the characters both were easy to follow. I just want to say WOW, what a wonderful romance story Leslie Gould has weaved us. She had me hooked right from the start and did not let go till the end. Be prepared when you start reading Amish Sweethearts to have plenty of time, because you will not wan’t to put it down. Ms. Gould did not disappoint me. The Lehmann’s and the Beck’s has been neighbors in Lancaster County, Pennsylvania for years, one is Amish and the other is English. Lila and Zane have grown up together and have been really good friends. Lila knows this could never work between them with her Amish and Zane an Englischer , so Zane goes into the Army . Will being apart help the two sweethearts to find other friends and move on with their lives? Believe me that this is one of those stories that has you glued to page after page till the end. I felt sorry for Lila and Zane and several times I felt tears rolling down my face. I loved this romance story , so get your copy and read Amish Sweethearts to find out what Leslie Gould has weaved in this wonderful story. I was given a copy of this book by the author for my honest review . If you haven’t read the first book then go read it. Amish Sweethearts continues the story with Zane and Lila grown up. I knew the premiss but wasn’t expecting some of the twists and turns it took….that and at times I thought both Lila and Zane were being pains. It was a great mix of life with the Amish and peaks at life in Afghanistan…you wouldn’t think an Amish book could mesh right with parts of it being in Afghanistan but it really worked. I loved this book, and I’m so excited for the next on If you haven’t read the first book then go read it. Amish Sweethearts continues the story with Zane and Lila grown up. I knew the premiss but wasn’t expecting some of the twists and turns it took….that and at times I thought both Lila and Zane were being pains. It was a great mix of life with the Amish and peaks at life in Afghanistan…you wouldn’t think an Amish book could mesh right with parts of it being in Afghanistan but it really worked. I loved this book, and I’m so excited for the next one!! This is book #2 in Neighbors of Lancaster County. Another great read by Leslie Gould! Can't wait to read #3. This is another good book written by Leslie Gould. The Amish people try to live simply, yet life can be complex at times for them. The love between Lila and Zane is truly special and complex in its own way. It started off as a typical childhood friendship and only grew stronger as the years went by. Zane joins the military--not something that the Amish approve of as this culture is generally known for being pacifists. I imagine that it would be hard to navigate the societal norms of Amish life w This is another good book written by Leslie Gould. The Amish people try to live simply, yet life can be complex at times for them. The love between Lila and Zane is truly special and complex in its own way. It started off as a typical childhood friendship and only grew stronger as the years went by. Zane joins the military--not something that the Amish approve of as this culture is generally known for being pacifists. I imagine that it would be hard to navigate the societal norms of Amish life when a person has a military background. But Zane learns a lot from his job assignment. The Aghan people are just as simple (or even more simple) than the Amish. They value family, community, and peace. He understands the importance of building relationships with the locals because they need to be valued as people. While Zane is away on a tour of duty, Lila must decide her own future. Should she comply with her family's wishes and marry the bishop's son or should she find someone else that she truly loves? Someone who understands her as much as Zane does? She's not your ordinary Amish girl--she loves poetry and current events. She's very open-minded to learning more about the world around her--because Zane loved to share his knowledge of things with her. The two have a beautiful friendship that makes me wish I had someone like that in my life. I don't think I would have made the same "rash" decisions that they made, but I do understand their reasons at the time. Emotions do run high and sometimes we make decisions without fully thinking things through. Amish Sweethearts is the second book in the Neighbors of Lancaster County series. It focuses on the Beck and Lehman families. The Beck's are Englisch and the Lehman's are Amish. This book continues the story that began in Amish Promises. The setting is six years later and Zane and Lila are now young adults. They both have deep feelings for each other but find the barriers between their two worlds insurmountable. In an act of defiance and an easy way to move on Zane joins the Army and Lila become Amish Sweethearts is the second book in the Neighbors of Lancaster County series. It focuses on the Beck and Lehman families. The Beck's are Englisch and the Lehman's are Amish. This book continues the story that began in Amish Promises. The setting is six years later and Zane and Lila are now young adults. They both have deep feelings for each other but find the barriers between their two worlds insurmountable. In an act of defiance and an easy way to move on Zane joins the Army and Lila becomes engaged to Reuban, a fellow Amishman. The people involved in this story certainly were patient. I would have given five stars but the story lagged on some. It was , for the most part, very interesting. I would recommend it if you love the Amish stories and life as I do. Wow! Loved this book! Five stars! This is the best book I have read by Leslie Gould thus far! Interesting people involved in this story, who certainly were patient. I would have given the book 5 stars because the story lagged on some. For the most part, very interesting read. I enjoyed this book as well. I guess I say this about every book that I read. Zane is an impulsive character. By this I mean he's jumps into things without thinking things through. I think also sometimes he's very headstrong. He doesn't want to listen to no one. He's also quiet and doesn't say much. I'm like that as well. There's nothing wrong with being quiet. I don't like a lot of drama so I keep to myself whenever I can. People like to pick on the quiet ones. Now that he's grown things are not I enjoyed this book as well. I guess I say this about every book that I read. Now that he's grown things are not what they always seem!! I do like that he's always putting other's needs first before his own. I believe I would want Zane as my boyfriend lol!! Lila is just the opposite of Zane. I think she is a little too timid. Always afraid of what other people will think. Lila is also a hard worker. She is a people pleaser just like I try to be!! Lila has been this way all of her life. I think opposites do attract!!! Tim is Lila's father. When we meet him in the first book he is very strict on his family. In this book it seems as time goes on, he lightens up a bit. I don't know if age has anything to do with it but we shall see won't we? Simon is almost like Zane except that he was raised Amish. He is on his Rumspringa. (Running around time for the Amish youth). He is his father's favorite son. Simon does a foolish thing too in my opinion. It's bad enough to hurt his father. Simon does something that no other Amish man would think of doing. It's against their beliefs. Daniel is Lila's twin. He's the opposite of Simon. Daniel enjoys being Amish. He finds a nice young lady and they've been dating for a few years. Lila has joined the church. Some things are forbidden. Some of the things that Lila does is extraordinary!! I don't think she would have done them if it weren't for Zane. Beth is a new character. She's a lively soul who brings joy to the students especially Trudy Lila's sister. Trudy is trying to be a matchmaker!! Maybe it will work maybe not. We'll just have to see.
. Shani is Zane's mom. She's the one that keeps her family together. Shani's a little flighty always on the go. She wears me out!!! But, I think without her, the family would fall apart. I do have to admire Shani. She a lot of determination!!! What I like most about is that she's a prayer warrior. Her faith is strong. It has to be!!! I have no idea what it's like over seas. This may be the reason that Zane does the foolish thing that he has done because his dad has had a great impact on him. In some ways, I wish that I had a dad like Zane. It seems like that you could learn some life lessons from Joel. Then there's Leona Lila's Mennonite grandmother. I think that Lila learned the hard way that no matter how old you that you can still get sick. I'm thinking that this is another of life's lessons. I know that it sure brought me down to earth!! I'm glad that Mammi made it through and that she had God's healing hand. I'm thinking that Lila and Zane are my favorite characters. They've been friends since childhood. It's great that this friendship will get them through the hard times. There are places in this book that made me cry though. There are some places where I wanted to punch someone's nose because of the way he bullied people around. God always has hand on things. They may not be what we want but in His own time!! I received this book from Bethany House in exchange for an honest review. I always enjoy reading about the AmIish, taken back in time to the simpler life, simpler but harder as living without the English use if electricity, phone's, etc. is a harder life. I've read books by the author Leslie Gould, and expected a lot from this book. I did not read book one of this series, although the book stood on it's own pretty well. Unfortunately I came down with pneumonia since reading the book and I have t I received this book from Bethany House in exchange for an honest review. I always enjoy reading about the AmIish, taken back in time to the simpler life, simpler but harder as living without the English use if electricity, phone's, etc. is a harder life. I've read books by the author Leslie Gould, and expected a lot from this book. I did not read book one of this series, although the book stood on it's own pretty well. Unfortunately I came down with pneumonia since reading the book and I have to do the review rather late, wish I had gotten it done right after finishing the book. I know why I didn't write that review immediately upon finishing the book. I felt really torn as I always like to make sure to give a positive review when I receive books for free, and especially when they are from an author I am sure I have read before and enjoyed. There was a drag in the story where things didn't come together for a story that flowed so well you felt the characters came off the page and you couldn't wait to see how their relationships were going to develop by the end of the book. I know I wasn't feeling well but I looked and there were some other people who were equally feeling something was slowing the story. Zane Beck and his Amish neighbor Lila Lehman were friends from the time they were children. No one had a problem with it even though he was English and she was Amish, they were children. After high school though they had feelings for each other, which they spent a lot of the time in the book avoiding each other and not telling the other about their feelings. I think that was the drag. Lila is being courted by the Bishop's son which is what her father wants, she really doesn't have feelings for him. When she turns her back on Zane he feels she does, that she will be married soon to someone else he takes himself out of the vicinity and joins the service, although he really doesn't have the stomach for fighting, and he is sent to Afghanistan. The Amish are very much against war, violence and for Lila to have a relationship with someone English who also served in the war, well it really is the entire second half of the book as she fights her feelings and he fights his and he also feels after he is injured but is told to return to service he doesn't want to go back because he really doesn't want anything to do with killing or injuring anyone. I did like the ending the book did come together and there seemed to be a lot of people who read the book and didn't seem to feel there was a slow start to it. I would say give the book a chance, you would probably enjoy this book especially if you read the first book. There were more than enjoyed the book and gave it five stars than those that felt there was something missing, and I was ill in between writing the review and reading the book.. I'm going to give it three stars which kills me because I know Leslie Gould the author is so highly regarded and the other books I have read of hers I truly enjoyed. So it may just be me. Give this one a chance. Description of book as written here: Can These Two Friends from Opposite Worlds Find Love? However, the passing of years and the distance between them isn't enough to halt their now hidden feelings for each other. If being together used to be difficult, it's now impossible, especially with the Amish opposed to war. Zane's service takes a dramatic turn when he's sent to Afghanistan. Being on the front line and the reality of taking a life has him questioning whether he can continue to serve or not. But all choices have consequences--both his and hers. With Lila preparing to marry another, will these one-time sweethearts ever find the life together that they both still long for? This is not your typical Amish romance book. This one steps outside of the box a little bit, and to be honest I was quite surprised by it. This book gives a little of everything, and will take you on a roller-coaster of emotions. It really has just about everything. Lila is a young Amish girl who has lost her mother, lives with her father, and is the main caretaker of the family. Her sister Rose should be a help around the house but is more lazy than helpful. Lila takes care of the household, hel This is not your typical Amish romance book. This one steps outside of the box a little bit, and to be honest I was quite surprised by it. This book gives a little of everything, and will take you on a roller-coaster of emotions. It really has just about everything. Lila is a young Amish girl who has lost her mother, lives with her father, and is the main caretaker of the family. Her sister Rose should be a help around the house but is more lazy than helpful. Lila takes care of the household, helps her father with chores when needed, and works outside of the home to help her family. She is courting an Amish man whom her father wants to see her married to. However, her heart belongs to her childhood Englisch friend who lives next door, Zane. Zane is a young Englisch gentleman. His heart also belongs to Lila, but they come from two very different worlds. Lila is not willing to leave the Amish. Zane joins the military to get away from his heartbreak of seeing Lila with another man, and is sent on a rather intriguing journey with his Civil Affairs Unit. Can the two find a way to make their love work? How could two people from such very different worlds possibly come together? I loved pretty much all the characters in this book even though I wanted so badly to reach through the pages and give them a good shake. Lila was by far my favorite character. She really had such a pure heart, and was willing to do whatever she could for anyone. However, she also had a stubborn side and wasn't focused on making herself happy. Zane is more stubborn than any of the characters in the book. He was tender hearted, but so frustrating I couldn't hardly take it. I just wished time and again he would pour his heart out to Lila instead of carry on. Rose was my least favorite character. She was incredibly lazy, seemed overly jealous of Lila, and just got on my last nerve. However, I can see where this could lead to a book just about her which I would love to read. There could also be a book about Lila's brother Simon which I would love to read as well. I was on the edge of my seat time and again while reading this book. There is just so much going on that you can't wait to find out what will happen next. The author does a fantastic job of leaving her readers wanting more. Everything was easy to imagine, and I appreciate that the story flowed so nicely without leaving me confused. This is book two in this series, but you honestly can't tell. I haven't read book one, and this book does a great job as a stand alone book. I do have to say, though, after reading book two I want to go back and read one just because I fell in love with the characters. It isn't often you find an Amish book where not only does the Amish girl fall in love with an Englisch boy, but there is suspense thrown in there with it. Zane joining the military definitely switched things up from your typical Amish romance book. I was left wanting to read more about Lila and Zane, but maybe in the future there will be more to their story. Until then I will just have to make do. I definitely recommend this book if you love Amish romance. More so if you like a little suspense thrown in. There are so many twists and turns to this book I don't see how anyone reading it could get bored at all. Amish Sweethearts is the second book in Leslie Gould’s Neighbors of Lancaster County series, coming after Amish Promises, and is the first book I have ever read by her. I wasn’t entirely sure what to expect, though I was pretty excited for this story, but unfortunately I have to say I was sorely disappointed. The storyline was slow, and there just didn’t seem to be much depth in so many of the scenes, and I found myself completely bored before I was even halfway through the book. 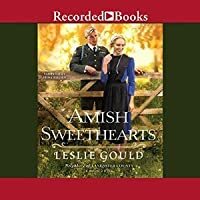 So, if I’m hon Amish Sweethearts is the second book in Leslie Gould’s Neighbors of Lancaster County series, coming after Amish Promises, and is the first book I have ever read by her. I wasn’t entirely sure what to expect, though I was pretty excited for this story, but unfortunately I have to say I was sorely disappointed. The storyline was slow, and there just didn’t seem to be much depth in so many of the scenes, and I found myself completely bored before I was even halfway through the book. So, if I’m honest with you, I have to say I didn’t actually “finish” this whole book, per se. I did skim it, and read a good deal of the end where things were actually slightly interesting, so I do know everything that happened. I just didn’t exactly read it. I really hate to have to do that with any book, but I just didn’t want to read if that meant reading that book—and I read all the time. I love it. So you know when a half-finished book sits on my table gathering dust, I’m really not enjoying it because once I get a few chapters in, I’m usually hooked and will finish the book within a couple of days, if not a couple of hours. Zane and Lila are perfectly wonderful characters, but both had their own flaws that made them a little bit harder to really love. Zane makes so many snap decisions! I mean, the whole reason he was in the Army was because he was running away from what might have been with Lila, and that’s by far the biggest snap decision, especially since it changes the course of his life for the duration of this book. But somehow he doesn’t learn from that mistake, and he almost gives his life away again later in the book, even going so far as to almost drag Lila down with him. And that brings me to the one issue I had with Lila. She’s so wishy washy! Now I know she’s had a hard life, and I know it’s difficult to go between what her dad wants—her to marry the bishop’s son—and what her heart desires—Zane. But still, to go back and forth the way she does, constantly leading on Reuben while still holding on to what little remains of her relationship with Zane, is just too much for me. While I understand it was a hard decision to make, she could have at least been honest with the both of them. And the way she just all the sudden makes a decision near the end kind of surprised me. After all that struggling, it seemed she made a really snap decision on what she wanted in her life. Anyway, I wish that I could say I liked this novel more than I did, but that wouldn’t be honest, so I’m going to have to say it definitely wasn’t my favorite book, and I’m only going to give it three out of five bookshelves. The end did get slightly interesting, and I did enjoy that part, so that’s why I’m giving this novel as many bookshelves as I am, but I wouldn’t highly recommend this story. Now I’m not saying don’t read it, because everyone has different opinions and you might just like it far more than I did, I’m just saying proceed with caution. And I hate with everything in me that I’m saying that, because as a writer myself I know how hard it is when someone criticizes your work, so I really despise doing it, but I vowed to write honest reviews, and I’m not going to stop now. So that’s what I really thought of this book. Zane and Lila grew up together, and have loved each since childhood. As neighbors, they spent their lives close in both distance, and in their hearts. Even though they have shared their deepest thoughts and interests, they have also shared the knowledge that a relationship with each other would never work. Lila is Amish, and Zane is not. He is an Englischer, as her community calls non-Amish people, an outsider. A bit like Romeo and Juliet, they have a forbidden love. When Lila was seventeen, Zane declared his love to her, and tried to get her to leave with him. She refused, and told Zane to go far away. Stunned by her rejection, and not thinking clearly, he does the one thing he swore he never would, he joined the Army. Now, a few years later, Zane is going to be sent to Afghanistan, with the very real possibility he might lose his life. He is also leaving with a heavy heart knowing he has never gotten over his love for Lila. Sadly, too, he thinks Lila has moved on. In the years since Zane left, Lila has been courting Reuben. In reality, she doesn't love him. However, Lila knows marrying Reuben will please her strict father, plus she hopes that eventually, she will love him. This is an amazing story that takes you from the peaceful Amish countryside, to the war-torn areas of Afghanistan. Amish ways, life-style and responsibilities are clearly portrayed through Lila's eyes. The author's words paint a very vivid picture of life for the soldiers, along with the civilians in war-torn Afghanistan. It is not hard to imagine how difficult it is for both sides to trust each other, and how one wrong decision can cost the loss of lives. It is also easy to understand the frustration Zane and Lila feel when it comes to making plans for the future, a life that doesn't include each other. It doesn't seem possible that the two of them will ever be able to find true happiness with, or without each other. With Zane in the Army, marriage to him would require Lila to leave the Amish community and church--and she refuses to do that. Amazingly with a surprising twist in the story, there is a happy ending. I must give you fair warning though, once you pick up this book, you will have a hard time putting it down. I highly recommend this 5-star book to anyone who enjoys well-written fiction. The publisher has provided bookreadingtic with a complimentary copy of Amish Sweethearts through Bethany House Publishing for the purpose of review. I have not been compensated in any other manner. All opinions expressed are my own, and I was not required, or influenced, to give anything but an honest appraisal. I am disclosing this in accordance with the Federal Trade Commission’s 16 CFR, Part 255. However, the passing of Can These Two Friends from Opposite Worlds Find Love? Seeing as this was my very first book I have ever read from this amazing author, I was quite pleased. Leslie Gould is a real treasure of a gem when it comes to Amish Authors that actually makes me want to read their books. Now that I have this one under my belt, I have a feeling she will become one of my favorites. She kept my attention through the amazing characters, heartfelt story line and just how much love, research and pride she puts into her books. Leslie Gould is definitely one to watch for sure. I LOVED LOVED LOVED this book! It made me laugh, it made me cry, it tugged at my heart many times. This book deserves 10 STARS not just 5. The characters are so relatable yet have their own stories to tell. My all time favorite characters were that of Lila and Zane. Zane reminds me of a very good friend of mine from high school if he were to join the military. It's amazing how well she got the character down of what I can imagine my friend going through. Lila reminds me a little bit of me when I get to going about hard work and caring about people. I practically devoured this book within two and a half weeks because it was so amazingly written. That being said, I must address the characters I didn't like so much. Grant was AWFUL! Couldn't stand him. Casey was nice, kind of your average girl friend that would have your back through and through. Lila's sister Rose was a stuck up brat. Her father just struck me as one who was hurt through life's issues that he had been handed. I loved Daniel....he was my next favorite character. He seemed to have a good head on his shoulders. Mandy seemed like a great fit for Simon due to her troublesome ways. LOL. Overall, this book is a MUST READ!!! 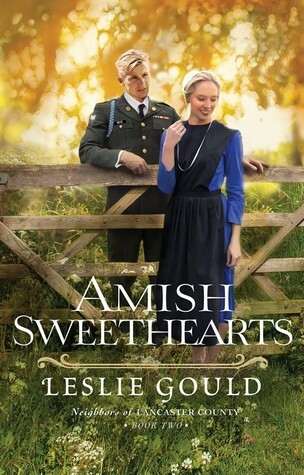 Okay, it kills me that I don't have a glowing review for Leslie Gould's new book, Amish Sweethearts. I always look forward to being transported back to an idyllic setting where the modern world fades away as faith, farms, and friendships take the forefront. However, with this book, I was rather looking forward to the last page. It isn't that I hated it--I just didn't love it. I'm sure my Kobo Glo taking over a minute to flip a page did not help, but I truly am not holding that against the ebook Okay, it kills me that I don't have a glowing review for Leslie Gould's new book, Amish Sweethearts. I always look forward to being transported back to an idyllic setting where the modern world fades away as faith, farms, and friendships take the forefront. However, with this book, I was rather looking forward to the last page. It isn't that I hated it--I just didn't love it. I'm sure my Kobo Glo taking over a minute to flip a page did not help, but I truly am not holding that against the ebook itself. I'll share one positive and one negative aspect of the story and then let you decide for yourself what you think of it! I'll start with the negative. For this being a love story, it drove me crazy that the two main characters spent over half of the book not saying a word to each other. To provide a little background, the two main characters (Zane, an Englisher, and Lila, an Amish girl) grew up next to each other and were best friends as kids. When Zane graduated from high school, they did not admit their secret feelings for each other. Instead, Lila started dating a nice Amish young man her father chose, and Zane, with a broken heart, joined the army so that he would have a purpose in life. Zane went off to war, which the peace-loving Amish people do not support. As the story progressed over the next several years, the pair would go out of their way to avoid each other, even though they were often within walking distance of one another. I just personally find it hard to believe that love could still burn so strong and could get stronger over time when you go out of your way to avoid the other person's presence. With the negative part of my review over, I'll tell you what I thought Leslie Gould did exceptionally well and that is transporting readers to a little written about setting--that of the mountainous region of Afghanistan. As an American, I have limited exposure to the people and customs of Afghanistan. I'm afraid I only hear about the country in terms of the war in Afghanistan, which I'm rather ashamed to admit. However, through Zane's time stationed in Afghanistan during the war, Gould really made me have a greater appreciation for the Afghani people and what their lives are like. I feel like I know more about Afghanistan from reading Amish Sweethearts than I have learned about the country in my entire life. She made the people seem real to me. I am more interested in what is happening in that country since I have a greater idea what daily life is like for its residents. It's not often that I don't write a glowing review. However, I promised to write an honest review in exchange for receiving the free ebook. I just saw the author’s name and agreed to read it. I didn’t even realize until I started reading it that this is actually the second book in the Neighbors of Lancaster County series. So the characters I grew to love in Amish Promises a I received a copy of this book from Bethany House Publishers in exchange for my honest review. Their Two Worlds Couldn't Be Further Apart. "Amish Sweethearts is book two in the Lancaster County series, but I would say you could read it as a 'stand-a-lone', although if you read book one first, it would help you be more acquainted with the characters in book two. This touching story does an excellent job of combining two very different worlds in Lancaster County. Living side by side as neighbors were Zane Beck’s military family who were English, and his neighbor and best friend, Lila Lehman’s family who were Amish. Despite the differences in their families, Lila and Zane grew up together being the best of friends. They not only had a special place to meet and play, but they also shared their dreams. Then, Lila’s mother had passed away leaving her with overwhelming responsibilities at home. Lila knew that she enjoyed spending time with Zane who listened to her, shared his zest for adventures, shared their dreams and their love of learning as Lila had not finished high school. As Zane and Lila's relationship grew stronger and they got older, they realized that their feelings for each other were changing, but they didn't want to admit it. Lila’s father, Tim was pushing her to court and marry the bishop’s son, Ruben. Because of this, Lila began pushing Zane away, and he became so disappointed that he ended up joining the Army rather than seeing his beautiful friend courted by Ruben, and was deployed to Afghanistan. For the next three years, danger in the mountain region of Afghanistan during the war followed Zane. The years he was away failed to extinguish the feelings each of them carried for the other. Whenever Zane came home on furlough it was difficult for the couple who weren’t supposed to love each other. How could this resolve itself? Would Zane and Lila ever get together? How were the differences in Zane’s and Lila’s positions overcome? Where did this leave Ruben? Would Lila leave the Amish? Love, healing, confliction and faith in what God's will for each life is shown in this heartwarming tale. The author shows us how praying and always asking God for guidance is the answer to life's uncertainty and confusion. I enjoyed this book very much, and I am anxiously waiting for book three." Thank you to the Bethany House Blogger Review Program for the opportunity for a free advance copy of this book in exchange for an honest review. Amish Sweethearts is the sweet romantic story of Lila and Zane. The story takes place in Lancaster County, Pennsylvania where Amish girl Lila grew up with her childhood friend and neighbor, Zane. Zane's family are not Amish like most of the community however they are friends with their neighbors. At a time of uncertainty of the future and as an act of rebellion, Zane enlists in the Army which takes him half a world away from his family and his best friend Lila. During this time, Lila must choose Amish Sweethearts is the sweet romantic story of Lila and Zane. The story takes place in Lancaster County, Pennsylvania where Amish girl Lila grew up with her childhood friend and neighbor, Zane. Zane's family are not Amish like most of the community however they are friends with their neighbors. At a time of uncertainty of the future and as an act of rebellion, Zane enlists in the Army which takes him half a world away from his family and his best friend Lila. During this time, Lila must choose between doing the right thing by marrying an Amish man her father approves of or to follow her heart and choose the man she truly loves. "Be still and know that I am God" Psalm 46:10 is the passage that carries them through the uncertain times. Through it all Lila and Zane keep their faith in God to show them the way. The characters in the story were very well written. The main character Lila is emotionally strong and hardworking. She puts her family duties like taking care of her sick grandmother and younger siblings above her own happiness. Always the dutiful daughter she spends her days between doing her daily chores and working at the local buffet to help keep her family financially secure. Zane on the other hand is straightforward and isn't sure what he wants out of life. He loves the Amish way of life and seems more Amish in his way of thinking than some of the others who are Amish such as Simon. Simon, Lila's brother is my favorite character. He's the rebellious son who dreams of life as a soldier in the Army against his father's wishes. He and Zane are like polar opposites. I like the introduction of Beth to the story as she seemed to calm down Lila and Simon's father and help him understand his children better. Casey is an Army friend of Zane who I could picture striking up a relationship with Simon. I feel like the people in this story could be people I'd be close with or who I'd like to have as friends and neighbors. A story of reconnecting old friendships and realizing the true power of love, Amish Sweethearts is definitely a must read for any Amish fiction readers! I couldn't seem to put it down especially late at night when I needed to be sleeping. I rate this story 5 out 5 stars! I received this book from Bethany House Publishers in exchange for my honest review. At first, I wanted to end my review with the first comment, but after writing a bit I decided to begin with my general thoughts and flesh them out. So for my second point, the premise. Zane is Mennonite, so the fact that he joined the Army isn't quite the same scandal as if an Amish boy had done so. However, it's still not totally normal either. It was interesting to consider the experience of someone with that sort of faith background and cultural upbringing in the military so this was a pretty original premise. I haven't read much of anything by Leslie Gould, but I found her to be a good writer and detailed in her research. As a librarian as I have said before, well researched books are important to me. What bothered me more than anything about this book was the friends-to-lovers storyline. I knew that is what this book was about going into it, but the way the couple's relationship was portrayed just didn't seem very authentic to me for some reason and as such, this book didn't hold my interest well. The love triangle aspect also was a bit off-putting, but again, I knew about that going into the book. Regardless of the fact that this wasn't my favorite book of all time, I do still think it is worth reading for fans of Amish fiction, this author, and those interested in how faith, relationships, and the military work together. I'm glad I got to read it! AMISH SWEETHEARTS is book two in the Neighbors of Lancaster County series by Leslie Gould. Ms. Gould does a fabulous job of combining the Amish world with the Englisch people living nearby. This is no easy challenge as the Englisch family, The Becks, are a military family. The Amish are pacifists and do not believe in fighting. The Becks, Shani and Joel, have a son named Zane. Lila is the Amish neighbor and Zane and Lila have been best friends since they were kids. Now they are older and Lila's dad has arranged for Lila to be courted by Reuben, an Amish man from her community. Zane can not handle seeing Lila and Reuben together so he does something stupid and impulsive and joins the Army. Even though they both are convinced they have moved on, Zane and Lila are both miserable. After some time, Reuben has grown impatient with Lila. He wants to marry her and begin their life together but Lila isn't ready to make that commitment to him. She knows in her heart she doesn't love Reuben they way he deserves to be loved. Zane is soon sent to Afghanistan and Lila tries to stay friends with him. She knows she isn't being truthful to Reuben as she also knows her life with Zane could never be more than friends. They come from two different worlds. She would never leave her Amish community and her family behind. She decides to end her friendship with Zane. She breaks both of their hearts in the process. Before you start reading AMISH SWEETHEARTS make sure you have plenty of time because once you start, you won't want to stop.